The week is wrapping up, and I’m afraid that the stubborn cold I thought I’d shaken off a couple weeks ago might be returning. 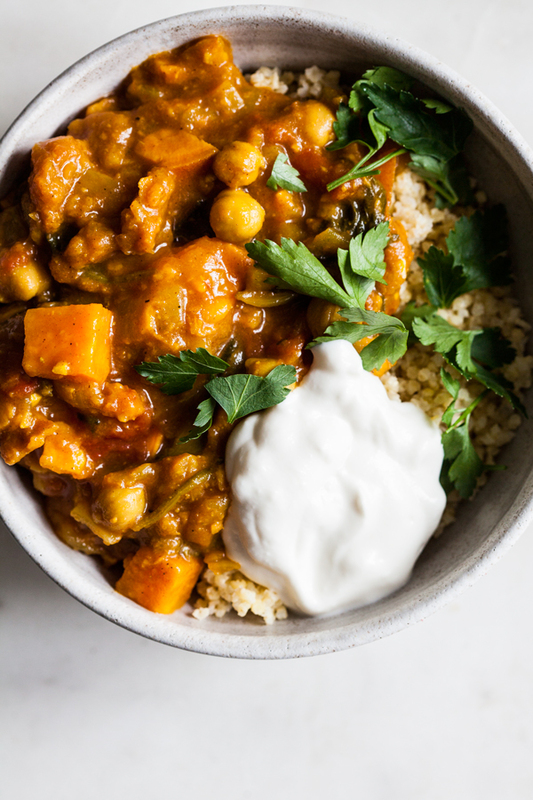 I’ve got work to do this weekend, but thanks to a stocked freezer and a giant batch of my friends’ Sonja and Alex’s Moroccan sweet potato stew, I don’t have to worry about cooking. The stew is fragrant, filling, and nutritious, and I’ll be eating it happily for days. This is a recipe from Sonja and Alex’s awesome new cookbook, Pretty Simple Cooking, which was published on Tuesday. 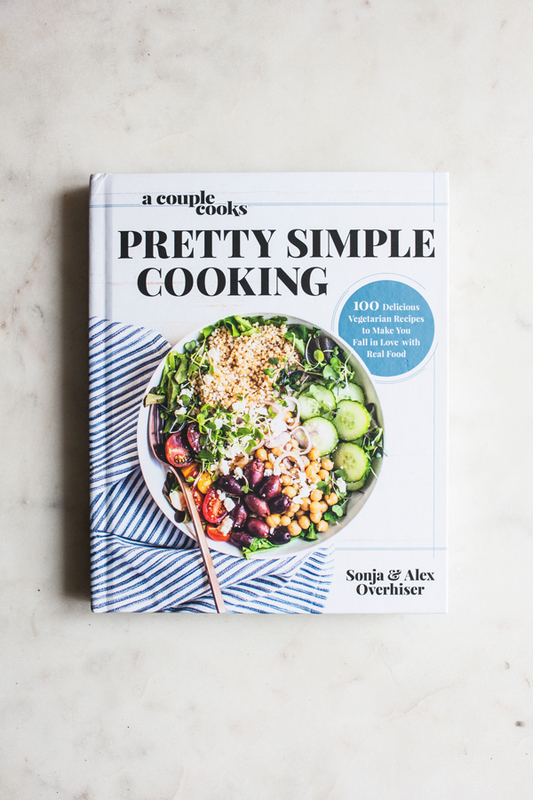 Those of you who read the couple’s blog, A Couple Cooks, know that Sonja and Alex are all about homemade food that’s as accessible as it is beautiful to look at and healthful to eat. The cookbook follows suit; it’s packed with everyday nibbles and satisfying main dishes that are easy to prepare. Sonja and Alex also have a lot of wisdom to share about building a healthful relationship with food; the Q&A I did with Sonja a couple years back is one of my favorite conversations I’ve had on this topic. When I first flipped through the pages of the book, I could tell right away that this is the kind of cookbook I’ll use often—it’s not a coffee table book (even though it is beautifully designed!) or an ambitious primer that I’ll pull off the shelf when I’m in the mood for a weekend project. 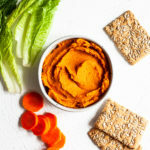 It’s packed with everyday favorites, like vegan chili and potato chowder, roasted cauliflower and black bean tacos, rainbow soba noodle bowls, and no-bake raw brownie truffles. These are staple foods, dishes I never get tired of. As you might guess, recipes are divided thematically among these themes. There are bread recipes to challenge those who are afraid of baking, minimalist recipes that foster an appreciation of quality ingredients, mighty mains that encourage slowing down and savoring something layered, and sweets that are indulgent, yet ialigned with mindful eating. Through it all runs Sonja’s friendly, personable form of culinary instruction, which I’m pretty sure could make any recipe feel doable. All of the recipes are vegetarian, if not vegan (and many are vegan), and I’ve got at least a dozen bookmarked. But I started with something comforting and wintery and great for fending off a burgeoning (or returning?) 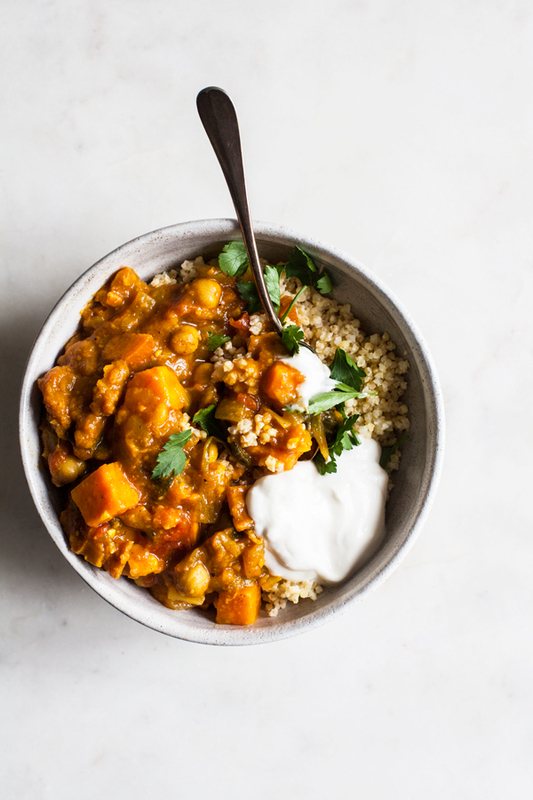 cold: the Moroccan sweet potato stew. 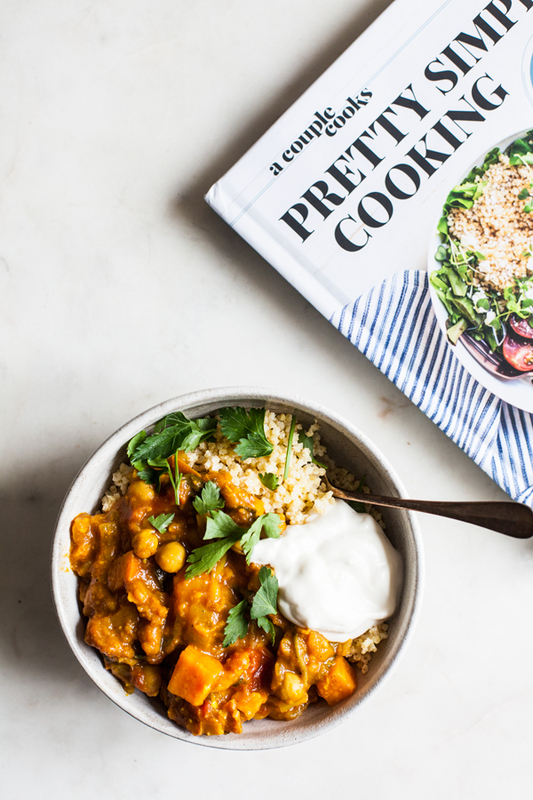 It features warming spices, chickpeas for textures, chopped apricots for sweetness, and it’s meant to be served with quinoa, though I made a batch of millet for mine instead. 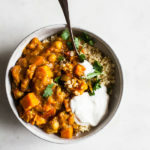 I smiled as I was preparing the recipe, because Sonja recently chose to make and share the Moroccan sweet potatoes and lentils from Power Plates on her blog! Seems as though she and I are craving similar eats right now. Here’s her hearty and stress-free recipe. Make the whole grain according to package instructions or your own favorite method. Peel and dice the onion. Peel and mince the garlic. Chop the sweet potatoes into ½-inch pieces, leaving the skin on. Roughly chop the apricots. Drain and rinse the chickpeas. Combine the cumin, coriander, turmeric, cinnamon, ginger, and red pepper flakes in a small bowl. In a large pot or Dutch oven, heat 2 tablespoons olive oil over medium-high heat. Sauté the onion for about 5 minutes, until translucent. Add the garlic and sauté until fragrant, about 30 seconds. Stir in the spices, 1 teaspoon kosher salt, and several grinds of black pepper. Stir about 30 seconds, then add the sweet potatoes, apricots, chickpeas, tomatoes, and vegetable broth. Bring to a boil, then simmer for 20 to 25 minutes until the potatoes are tender and beginning to break down and the liquid is reduced. Stir in the spinach and simmer until wilted, about 2 minutes. Remove from the heat and allow to cool slightly. Immediately prior to serving, stir in the lemon juice and ¼ teaspoon kosher salt. Serve with your whole grain of choice, garnished with torn cilantro leaves and a dollop of yogurt or cream. I made a couple of very tiny tweaks to the recipe: the millet instead of quinoa (I was out of quinoa), and I used my cashew cream in place of Greek yogurt. Sonja also has a killer recipe for creamy cashew sauce, which she suggests to make the recipe vegan. Pretty Simple Cooking has a bunch of easy tips like that—suggestions that will turn a recipe from vegetarian to vegan without any losses in translation. I’m so enjoying the practicality and warmth that this book has to offer, and I can feel all of the love that Sonja and Alex poured into it. And I’m happy to be sharing a giveaway copy with one US or Canadian reader, below. I’ll announce the winner one week from today. And if you live in NYC and would like to hang out with me and Sonja in person, we’ll be doing an event together at Essex Market on 2/22. 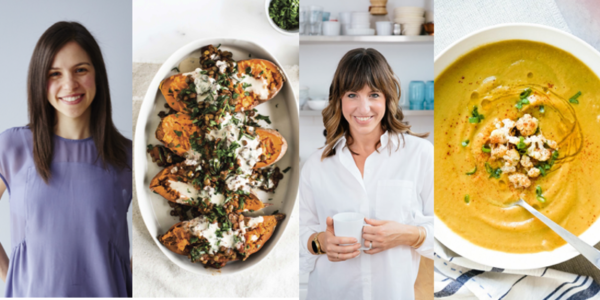 You can get the details here: we’ll be making recipes from our books, chatting about making weeknight cooking a reality, and sharing some of the lessons we’ve learned about home cooking along the way. We’d love to see you there. Huge congrats to Sonja and Alex on their publication, and loving wishes to everyone as we move into the weekend. See you for the reading roundup. Roasting a pan of vegetables and tofu is my go-to. Hope you’re on the mend. I love soba noodles with kale smothered in a peanut sauce. This stew looks so delicious. Can’t wait to try it! This looks great! My favourite pretty and simple recipe for weeknight cooking is tacos. my favorite pretty and simple weeknight recipe is a pasta with asparagus, tomato, and spinach/arugula, in a simple garlic-coconut oil sauce, with a little tamari. I cook the asparagus with the pasta, in the last few minutes of cooking. While the pasta cooks, I chop the tomatoes and greens. Then I strain the pasta and asparagus, put it in a big bowl, put some coconut oil and garlic powder on it and stir well. Then I add the tomatoes, greens, a little tamari, and black pepper, maybe a little tarragon or thyme, and stir one more time. So easy, very colorful and pretty, and so tasty! 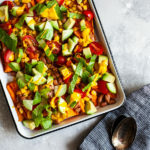 I love making grain and legume bowls with veggies and a nice sauce, inspired by you! Wondering if it would be possible to substitute diced butternut squash for the sweet potato! Thanks so much for the recipe, looking forward to making this! Absolutely! I think that would be delicious. I hate to say it, but most of my cooking isn’t very pretty! But keeping an open mind, I’d go with my stuffed baked potatoes. Salads are my favorite pretty and simple recipe. The colors are always so pretty together with the different veggies. Roasted veggies – easy and tasty. This looks so delicious! Perfect for the rainy weekend we are having here! 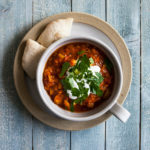 This looks like such a comforting dish to make on a chilly night. My favorite simple recipe has to be a mixed green salad with homemade vinaigrette — easy and delicious. Thanks for the giveaway opportunity! I like a good bowl 🙂 A grain, a green, a veg and a bean with a yummy sauce. Gotta love bowls because they cook up fast and you can make them fix almost any craving if you have enough good sauce recipes. Plus they are easy to make beautiful. Wondering how veganizable this book is? 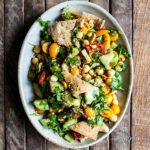 You noted that there are some recipes that are already vegan, but are the vegetarian ones easy to make vegan with pretty simple swaps? Definitely. Sonja suggests swaps to make recipes vegan throughout. I’d say it’s highly veganizable, with a few exceptions. I love hot pots. They are pretty simple to prep, usually just chop a bunch of veggies, cubes of tofu, and add all the broth/stock components. Then just boil. Some only need 15 minutes, but I don’t mind having to wait 30-45 minutes for heartier bowls since I can do other things while that happens. Currently, Laura’s root veg dal from the First Mess cookbook. I have made it weekly for the past 6 weeks! Just got your cookbook from Amazon as well as a new dutch oven so this is perfect. First of all, this recipe looks delicious — thanks for sharing! My regular week night rotation includes an easy, broth-based mushroom soup with orzo and leafy greens.